Follow the instructions below to create a username and password. School Leaders: Ready to join? Click here to establish an NHS chapter at your school. 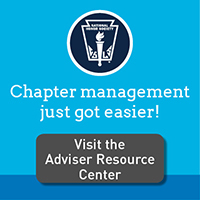 If you are retiring or moving on, or if you are the new adviser, please complete and submit an Adviser Change Form. A confirmation e-mail will be sent to the new adviser once the change has been made. Stay informed with quarterly newsletters, and join your peers across the globe receiving updates from the national office. By creating an account, you will have access to additional information, content, and resources concerning NASSP’s programs and activities, including information pertaining to the National Honor Society, National Junior Honor Society, National Elementary Honor Society, and National Student Council. * Email Address: The email you provided above is already in use. Please enter a different email address to proceed. If you are under the age of 13, you must submit a completed COPPA Parental Consent Form. To edit a school address, please contact Member Services. * Confirm Password: Passwords must match. You appear to already be registered on our site. Log in if you remember your username and password. I forgot my credentials so please send instructions to me by email. Create a different account using a different email address.